With spring here, we’re now waiting the coming warmer months, and all you ladies know what that means: swimsuit shopping season! The trick, when picking a swimsuit, is to choose one that will accentuate the physical attributes you love the most about yourself and will make you feel more confident. For instance, a heart-shaped top will beautifully emphasize your chest; off-shoulder tops always embellish shoulders, a one-piece with cut-off sides will give you an hour-glass shape; low-cut bottoms, when paired with a top that doesn’t cover the stomach will lengthen your bust; high-waisted bottoms helps hide lower stomach while highlighting the top of your body if paired with the right top, etc. We’ve gone on the hunt to find the very best in swimwear from each of the high street stores you know and love. And, as a bonus, we might have included a few under-the-radar brands that we felt you needed to know about. Nothing makes me happier than trying to find the perfect swimsuits to wear during the summertime and the hunt for these starts as early as April! I have browsed the web for you, in search of unique, and gorgeous pieces that will make you glow at the beach or poolside when the heat waves hit. Keep reading to find out more! Buy trendy plus size swimwear and swimsuits that are made to fit you. Shop our 2018 bathing suit collection for your choice of sizes, colors, and prints. Hit the beach in a trendy bathing suit cover-up or beach dress from look.co.uk today! Shop our collection of bathing suit & swimwear cover-ups, skirts & wraps. With the ability to wear them from a day in the sun to a casual night out anything is possible. Shop a variety of lace, embroidered, and floral cover-ups in bold colors that are sure to have all eyes on you. Cover-up rompers are the ultimate throw on & go. Discover endless options that make your vacation getaway a breeze. 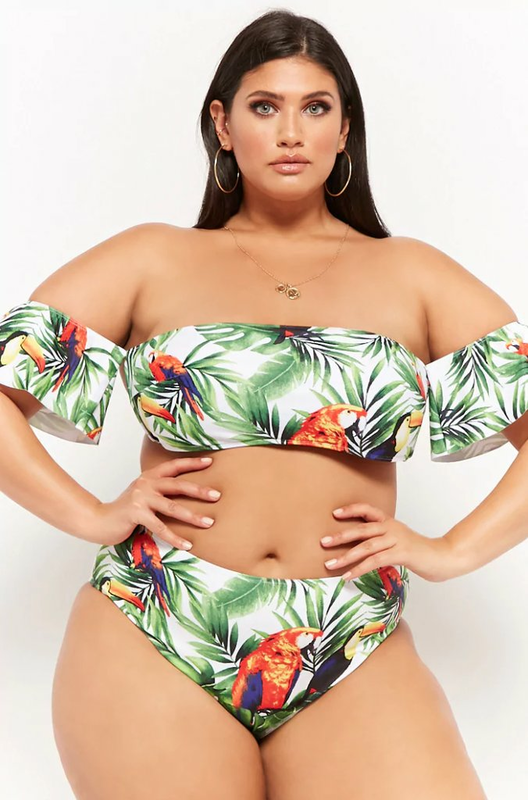 Nothing flatters your womanly figure quite like the waist cinching, booty lifting goodness of a high waisted silhouette, and look.co.uk carries a large assortment of high waisted swimwear to make you feel great at the beach or pool. These retro-inspired bikini styles cover a broad spectrum of sizes from 0 to 4X, and they come in an assortment of colors and patterns to suit any taste. Highlighting your figure while still giving your chest enough support, the deep V can be bare or can have a sheer overlay ­– any way you go, you’ll still get that va-va-voom! In solid colors or patterns, a one-piece suit looks seductive without going overboard in the skin department. While you can definitely swim in a suit like this, it also has you looking gorgeous when you’re just lounging around!